Darts and pool are played in the majority of English pubs, as is the case in most taverns in the U.S. However, unlike a typical American tavern, the authentic English village pub is the true hub of the town. And, in the case of The New Inn (a name that is somewhat a misnomer since parts of the building were constructed in the 16th century), it's ever-so-much more. In Willersey, The New Inn is the gathering place of the local football team, where the players change into their uniforms prior to a game. It's also used for meetings by several of the town's charities. Birthday celebrations are often held there, as are get-togethers to commemorate engagements, marriages and wakes. Messages are left for other villagers: "When you see Harry, tell him I need my fence fixed" or "When Jim comes in, ask to make sure Fred is all right." Children are welcomed, and even well-behaved dogs are allowed to come in to snooze on the floor. On this particular Sunday, a family of three generations was seated at a table enjoying their lunch. One of the things I learned, while visiting The New Inn, is the reason why cars are driven on the left side of the road in the U.K. It's a vestige from the past, when people walked or rode horses as their means of transportation. Because one never knew for certain if the individuals you'd encounter would be friendly or highwaymen, everyone passed by each other on the side where their sword hung. What happened if you were a lefty, I never found out. 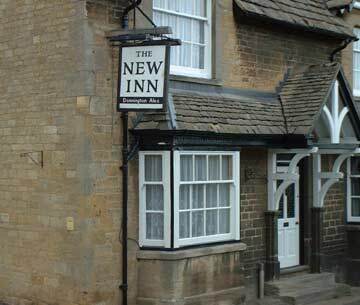 On Sunday, The New Inn opens at 1pm, after church services are over, and closes again at 3pm. Those afternoon hours provide an opportunity for people to come in for lunch and, in this instance, to enjoy a game of Spoof. A few hours later, the pub opens again for the rest of the evening. As you've probably heard, the beer served here is merely 'cool,' not cold. Although surprising at first, I found this change quite easy to become accustomed to. Perhaps it's because the typical, local beer from the tap seems to have a more enduring quality and, daresay, thickness than the thinner, more bubbly American style brew. It will be difficult to return to what passes for beer in the states. But, enough of the description of our locale, let's go play some Spoof! Spoof is a simple, pub, gambling game. According to Malcolm, a possible reason for its enduring nature is that it's virtually impossible to cheat at it. As you'll see, the game also allows for a high degree of interplay among the players. On a rotation basis, one person has the 'fetch,' which means they start the game. That person then begins by guessing how many coins, in total, are in all the fists on the table. Then, in a clockwise rotation, each person, in turn, makes a guess of their own. No player may choose a number that has already been taken. When all have made their guess as to how many coins are in the total of all players' hands, all the fists are opened to show how many coins each person has in his or her hand. Whoever has guessed correctly is 'out.' In the event that no one has guessed correctly, the round is replayed. The game then continues, with fresh clutching of the fists for those remaining 'in,' and with fresh guesses at the total coins held in the fists on the table. Some of the cunning, old players are so familiar with each other's games and favored numbers, I'm told, they will try to steal that number or confuse their friend with a high or low call. The game continues until the last person is duly, and fortunately, called out. The other players are fortunate because the loser at the end of all rounds buys them whatever the stakes dictate. This might be as much as a pint of beer, but is more often a half-pint or a cigar or a bar of chocolate. One of the maxims of the game, and something that no doubt contributes to its attraction, is that it's extremely rare for anyone to lose three times in a sitting. Although the game is serious, and the rules strictly adhered to, it's conducted amidst much laughing, joking, ribbing and general good humor and cheer. In other words, it's a way for neighbors and friends to catch up with each other about how their week has been. And, on rare occasions, it's an opportunity to have both an afternoon's fun and a pint or so at your friends' expense. What's not to like about that!